I believe most people share my belief that Red Bull is one of the companies that best make use of sports as a marketing tool and best activates its properties. In the activations that can be seen on the videos below, which took place in 2007 and 2008, the company further enhanced this perception. Red Bull took its Formula 1 racing car to the streets of two of the biggest Brazilian cities (São Paulo and Brasília). This had phenomenal impact, generating buzz, spontaneous media, content for web, viral, etc. .. Almost the full package. The undoubted success can be proven by the continuity of the action. I hope they keep this way. I believe everyone knows Heineken sponsors UEFA Champions League. It’s very clear, since the brewery is always reinforcing its position. Its ads on the opening and closing of the broadcasts, with the famous lyrics of the start of the games (“These are the Champions”) don’t allow this to pass unnoticed. UEFA surely agrees with its media partners a preference to sell the broadcast sponsorship to the event sponsors. However, they don’t have to exercise this preference. Therefore, congratulations to Heineken, who does it with a lot of competence, what can be seen on the videos below. This post starts with the picture above following the saying: “a picture says a thousand words”. Hugo Boss, who already uses its sailing sponsorship and its gorgeous images to spread very cool pics and videos through internet (above), this time, innovated. They joined together sailing and wakeboard and generated unique images that are surely being spread on the web. Radical sports are extremely rich in amazing images and moves. Surf, for its scenario, is almost perfect. Nescau, the Brazilian market leader in powdered chocolate, shines in its Super Surf, the Brazilian surf championship, sponsorship. The brand not only sponsors the event, but “owns” one of the most exciting moments: the Expression Session, a moment in which all the athletes go into the water together and the one who makes the best trick is the winner. The brand dresses the athletes up with its colours (red and yellow) and the excitement takes the public on the beach, who can’t take their eyes off of the sea. This action generates more exposure for the brand in the event and in the media coverage and provides several extras, like content to the brand website, promotional opportunities, relationship with the spectators on the beach and at home, images for packaging and several others. Of course, the concept of the action aligned with the brand’s concept is essential. This action was piloted by the brand’s agency (JWT), together with the event promoter (Abril) and, of course, Nestlé marketing and communications teams. I had the pleasure of taking part in the sponsorship activation for the public on the sand (with Aktuell), a case I’ll share with you in a later post. Take a look at the Nescau Xpression Session in Porto de Galinhas 2008 in the video below. It’s really exciting! Back to simpler ideas that leverage return, this small label / sticker placed on the top of the microphones during collective interviews guarantees the brand exposure whichever filming angle the TV network chooses. I don’t know who the first to use it was, but it is definitely clever and is being spread. 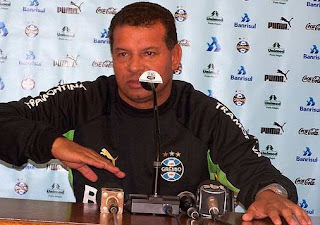 Here you can see it being used by Grêmio and Corinthians. The pics are very small, but it looks good on TV. In the last post I talked about a simple and effective activation. In this one I’ll remember a not that simple one, but it is one of my favorites. 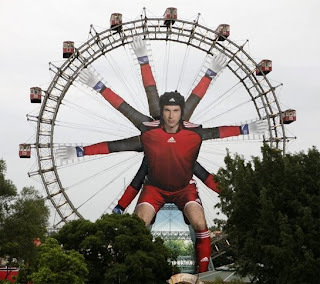 Alright, it’s not that up to date, it happened during Euro 2008, but it’s worth remembering. 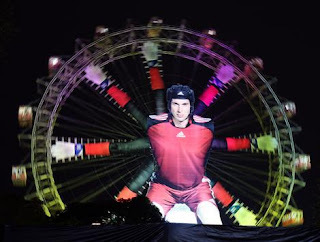 Adidas, with an image of the goalkeeper Peter Cech in a Vienna Ferris wheel, marked its territory as an event sponsor. Take a look at it in the morning and during the night. For several times complaints have been heard that Globo and its channels (the biggest Brazilian media group) jeopardizes sports for not saying or showing sponsor companies names and logos in their spots broadcasts. This is almost common place in any discussion involving sports professionals. However, as said in the opening post, the objective here is not to discuss this scenario, but to promote the activation best practices that leverage the results of all involved with sport. 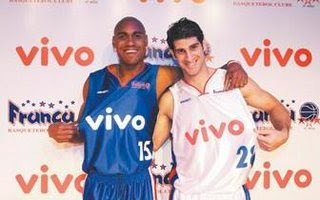 In this sense, Vivo (a Brazilian Telecom Company) Franca Basketball team, with a way too simple action, increased its brand and its main sponsor exposure. 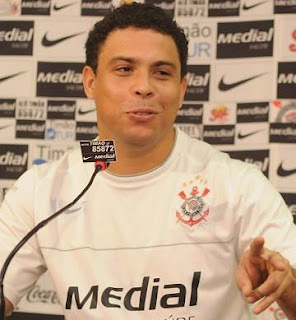 When the athletes are interviewed by TV reporters in the court, a person positions himself behind him with a portable backdrop, making the brands exposure inevitable. If the idea came from Vivo, congrats. If it came from Franca, congrats as well, once it demonstrates the worries in guaranteeing the return on its partner investment. Unfortunately, I could not find a video or image showing it. If you have it, please send me. 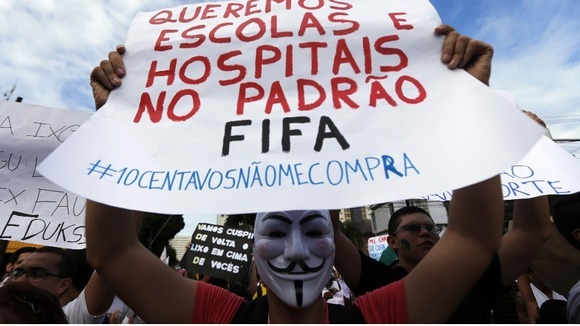 If not, try to take a look at it next time they’re on TV (if you’re away from Brazil, sorry…). What about you? Have you seen anything like that? What do you think of it? Since I was really young, sports have been a passion to me. I’ve always been hungry about consuming sports, be it practicing or following it live or through the media. Later in my life, I decided to join it together with another of my passions, marketing, and ended up working with sports marketing. In all these years dealing with both these passions, I’ve come to realize that one of the biggest mistakes in this market, today, is the lack of sponsorship/partnership activation. This jeopardizes the results of all involved, but mainly sports, which fight for survival. A lot of companies invest huge sums of money acquiring rights they don’t use, even though they are a powerful and complete tool, which may generate several opportunities within the mix (products launch, sales growth, relationship, endomarketing, etc.). The result is not as good as expected by the sponsor and, in extreme scenarios, there are no results at all, causing rejection to the tool. Of course this is not only the sponsors fault, but of everyone involved in the process (sponsees too, of course! ), once the bigger the return each one achieves, the better the event, the bigger the audience, the better the future return, the better the event, the bigger the audience and so on. 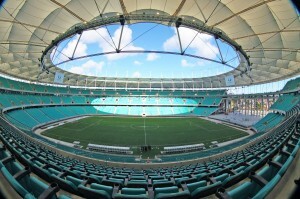 This scenario motivated me to create this blog, whose objective is not to discuss the reasons that led to it, but to promote the best practices in the area, and thus be able to contribute somehow to increase sponsor companies’ return on investments in sports and, ultimately, increase sports’ chances of success. This, of course, is an open space. Please, feel free to contribute. Always!